Gathering together in worship is the heart of our life at St. Peter’s. 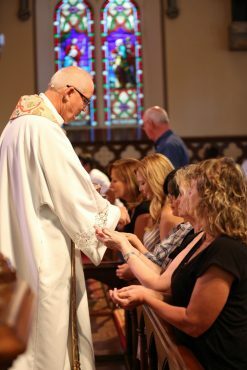 At each of our Sunday services we hear the story of God’s salvation and we share in the Holy Eucharist, the bread and wine that unites us with the risen Christ. We worship in a beautiful building that was built hundreds of years ago and through whose doors thousands of souls have passed. Each of those people was on his or her own spiritual journey—questioning, seeking and finding God here. St. Peter’s embraces its magnificent past, but we also look hopefully to its future. We welcome everyone who comes through these doors. And once you enter, the message you’ll hear is that it’s okay to seek new answers to old questions, and that God’s covenant to us is that he will love us no matter what or who we are. That love allows us to take risks in our lives and to follow the truth where it might lead us. Children are welcome at all times – Relax! God put the wiggle in children. Don’t feel you have to suppress it in God’s house. From the last Sunday in June through Labor Day, there is one summer service at 9:30 am.